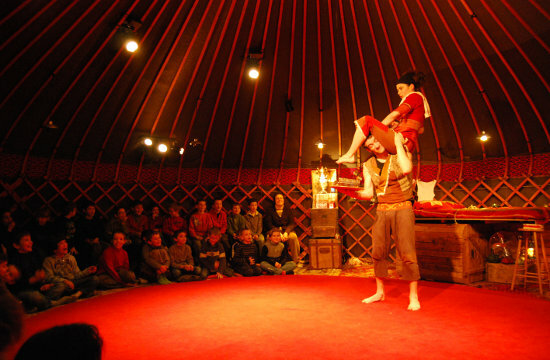 With the mission of introducing very young children to contemporary circus, Festival des Rêveurs éveillés (the Festival of Daydreamers) is pitched to the 3-6s and takes place scattered over the libraries, community centres and municipal buildings of Sevran, a northeastern suburb of Paris. 2011 is the twentieth anniversary of the festival, and there's a programme that draws work from round Europe. The north star of Finnish circus, Circo Aereo, are there with Trippo a sweet, miniature two-hander that travels around in a wooden carriage; Belgian company D'irque & fien fly in with Carrousel des moutons, a piece with a surprising bit of stagecraft that toured Europe very vigorously all through the summer; French Compagnie Prise de pied take the audience into a circus yurt for Thé perché; and there's more besides from France and Germany.